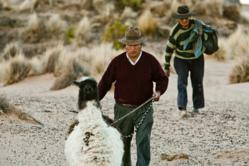 The National Director of PCI Bolivia and the Bolivian Ministry of Rural Development & Lands will host an international symposium titled "PCI’s MIS Llamas Project: A Successful Value Chain Model to Promote Rural Development" on March 29th - 30th, 2012 in La Paz, Bolivia. The Bolivia Altiplano (high plains) is a region marked by isolation, hardship, and extreme poverty where families depend largely or entirely on llamas, a camelid animal uniquely adapted to the region’s harsh environment. Since 2003, PCI’s MIS Llama project, funded by the United States Department of Agriculture (USDA) Food for Progress program, operated in over 130 Altiplano communities and helped nearly 40,000 Bolivians directly improve their livelihoods. The international symposium will outline key program achievements since 2003 such as a 196% increase in family net worth, a 346% increase in participant annual income, and a 15% increase in average llama herd size among small holder rural producers in the region. The event is a key component of PCIs strategy to document and disseminate final project results and best practices, to inform and help to improve the entire Bolivian llama sector, as well as camelid production in other Andean countries such as Peru, Argentina and Ecuador. In addition, representatives of the MIS Llamas Producer Association, including 37 meat, hide and fibers processing committees formed by PCI, will be showcasing their products at the event. The conference builds upon precursor events held in 4 Bolivian departments this winter: Cochabamba, Oruro, Potosi and Tarija, with participation from state and local government officials, technical specialists, NGOs and camelid producers. “PCI is proud of the unprecedented success of the MIS llama program, and for the thousands of beneficiaries that have improved lives as a result. We hope the learning we share at the conference will become a template for other rural communities to create lasting impact for their populations,“ commented George Guimaraes, CEO of PCI. Please RSVP for the conference by email to enava(at)pci-bolivia(dot)org To learn more about PCI and its impact of global health and humanitarian work, please visit http://www.PCIglobal.org or contact Annette Gregg, Senior Director of Marketing & Communications, at (858)279-9690.